We moved to Canada in 2004 and the house we purchased had telephone cables and co-axial TV cables running to all rooms. We then used a dial-up modem connected to the telephone cable for accessing the Internet. Any room which needed a telephone had an stand-alone machine. With the availability of cheaper digital cordless telephone with four remotely connected handsets and also with multiple facilities like answering machine, call display, etc, the first set of cables to be decommissioned were the two-wire telephone cable that connected every room of the house. We still had the coaxial TV cable running to all rooms. Now the telephone handsets started communicating wirelessly and the handsets could be moved with its battery charger to any room it was required. With the introduction of cable modem, router, and Voice Over Internet Protocol (VOIP) telephone system few years later, the two-wire cable was terminated outside the house. We had to now run Cat 5 cable all through the house where ever a computer was to be connected to Internet. In an year came the Wi-Fi. In came a new Wi-Fi router and out went the Cat 5 cables. Introduction of revolutionary Universal Serial Bus (USB) to connect anything and everything to a computer or a computer like device overhauled the cabling system of modern gadgets. Most cellphones and electronic devices started using USB charging. Most electrical outlets in hotels, airplanes, trains and buses came with USB ports built in to facilitate charging without an adapter. Home improvement stores started selling electrical outlets with USB connectors. Thus most of the electrical outlets at our home took a new avatar with USB port. Introduction of Light Emitting Diode (LED) in home lighting, TV, computer monitors, displays on most home appliances has in effect reduced electricity consumption. Now most devices at home (except appliances like fridge, dishwasher, laundry systems, oven, cooking range, microwave oven, etc) use 12 Volt Direct Current (DC) as power source. Major weight and space consuming element of an LED bulb is the rectifier circuit which converts high voltage Alternating Current (AC) to 12 Volt DC. With these 12 Volt DC appliances, mostly using USB to connect to power source, isn’t it time that we wire our home with 12 Volt DC cabling with USB ports? At the end of the nineteenth century, ‘War of Currents’ between the American entrepreneurs Thomas Alva Edison and George Westinghouse resulted in AC being used in homes as transmission, resulting in much reduced costs and transmission losses in comparison to DC transmission which required booster stations every 10 km. Nikola Tesla, then working with Edison, was in favour of AC and he disagreed with Edison about the use of DC current. Tesla resigned working for Edison and joined Westinghouse. Our sun, transmit energy as radiation through air without any wire. If we can build solar cell that can give near 100% or even 70% efficiency, it will usher in wireless power transmission. Tesla dreamt of a global wireless power grid that any home, business, or vehicle could tap into. 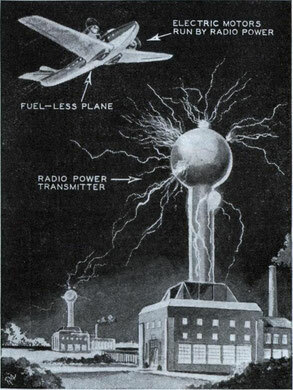 In 1934 the above drawing of a large transmitter appeared in an article on wireless power transmission. The caption read, “Nikola Tesla, electrical wizard, foresees the day when airplanes will be operated by radio-transmitted power supplied by ground stations.” The closest he ever came to realising his dream of wireless transmission was the Tesla coil, which he created in 1891. 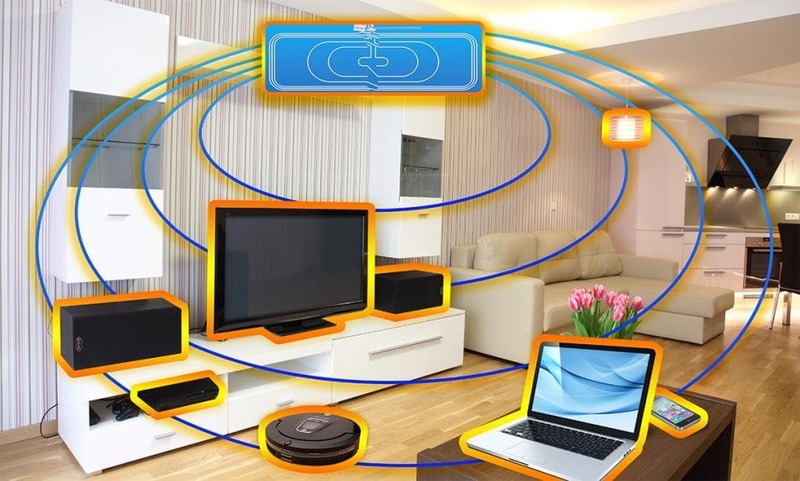 Researchers at Stanford University have developed a wireless charging technology capable of transmitting electricity wirelessly to a moving object nearby. If the technology is upscaled, it may allow electric cars to recharge while in motion. It is nowhere near Tesla’s dream of airplanes flying on electricity. As the team described in their recently published Nature study, the transmission achieved was much smaller than would be needed to power vehicles. 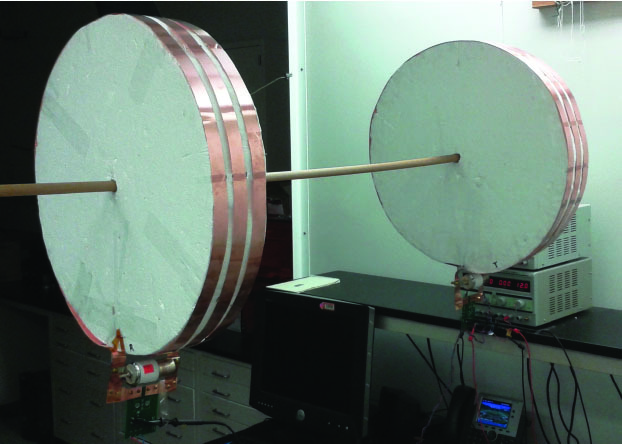 However, they did reach a kind of mid-range wireless power transfer based on magnetic resonance coupling. Electricity passing through wires creates an oscillating magnetic field, and it’s this field that causes a nearby coil’s electrons to oscillate. This in turn transmits power wirelessly. However, it’s a complex process and is only efficient when the oscillating coils are tuned with respect to the moving object. This research is part of an overall push toward safer, clean energy highways with more manageable traffic that will eventually support self-driving cars. If this dream fructifies, you’ll be able to charge your electric car while driving on the highway. A coil in the bottom of the vehicle could receive electricity from a series of coils connected to an electric current embedded in the road. With coils embedded in the roads, we could eventually enjoy a totally automated highway system. Self-driving electric vehicles could be wirelessly charged en route, and GPS and other navigation systems would also be powered wirelessly. Stanford research team will pave way towards achieving Tesla’s dream of wireless electricity in near future. In case they succeed in their mission, soon we will be using transmitted electricity to power our low powered DC appliances like home lighting, TV, computer monitors, etc. This will allow lot of flexibility and reduce electrification cost. LED lights will become much cheaper as they would have done away with the rectifier circuit. “Dreams pass into the reality of action. From the actions stems the dream again; and this interdependence produces the highest form of living.” Anais Nin, French-American diarist, essayist and novelist.